GATE has 65 questions for which total time of 3 hours is provided. Its becomes difficult for students as some questions are lengthy and numerical based. Also the paper is online it is more difficult to complete paper in 3 hours. Sometimes we leave easy questions because we are left with no time, or we were busy in questions we dont know. GATE-Prepladder has shared some tips for time management. Time Management: This is the most common problem among candidates.Most of the candidates fail in effective time utilization.Never get stuck on a question for too long.As such, the paper is very lengthy.If you do not know a question, advance onto next question.You can return back to the question after completing the rest of the paper. Attempt General Aptitude Questions First: If you attempt general aptitude with fresh mind , there are more chances to get them right. As you know, questions in GATE exam are technical and conceptual and solving them is a time- consuming process.They are complex and cannot be answered in hurry.General Aptitude questions comprise of numerical and verbal ability questions.Verbal ability comprises of English Grammar and Numberical ability comprises of Data Interpretation,Reasoning and Quantitative Aptitude.This section does not involve any technicality.Its a highly scoring section.You should be well prepared in GA to score high. 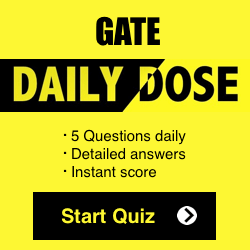 FREE Daily Quiz for GATE-2017 Preparation. Attempt Group Questions : As you know group questions are based on some common data and they have high weightage,so its better to attempt them first if you are well-versed with the question. Remain Calm: Remain cool and calm in examination hall.Never panic otherwise questions would go wrong.Stress would only make things more worse.Attempt questions which you know first and after completing the paper move to unanswered questions. Use Tricks To Solve Questions: Aspirants often take coaching from renowned institutes.Some candidates prefer self- studies over coaching.In either case,candidates become aware of shortcuts and tricks.You must use all possible shortcuts and tricks to arrive at the solution in least possible time.Gate-Prepladder shares trick to solve questions in less time. Read Questions Thoroughly: Read questions and instructions thoroughly.Do not jump to conclusions.Do not misinterpret any question.Try to analyze what the examiner is intending to ask.Remember every mark counts.Analysis say that if a problem takes more than eight steps to solve,candidates much re-look at the approach. Students must maintain a balance between speed and accuracy.Do not mark wrong answers in hurry.If you do rigorous online practice before the exam,you will be able to maintain this balance.Remember in exam both speed and accuracy counts.Always remember that one problem can be solved in numerous number of ways.So,being innovative will help you to arrive at solution quickly.Innovation will come through intense practise before the exam.As you practise, you will come across different ways of solving the same problem. Make your own exam strategy: This is surely the key to success.You must make your exam strategy before apperaing for exam.Remember without planning,goal cannot be achieved.Some candidates attempt questions in exam order while some pick up questions randomly.In my opinion,go through the entire paper quickly and answer those questions first which you are aware of.Later on,attempt unanswered questions. Be careful and accurate in answering questions: Mark answers with accuracy.The penalty for wrong anwer is negative marking.Be cautious in answering as this could severly affect your score and hamper your chances of entrance.You can review the options if you are not directly able to arrive at the solution. Review the options and see which option fits the question best.This will greatly help you in arriving at solution quickly. Do not make Blind Guesses:This is very important aspect.Making blind guesses will result in negative marking.Do not answer questions just for the sake of answering.This way you will lose more marks.Take calculative risk only.